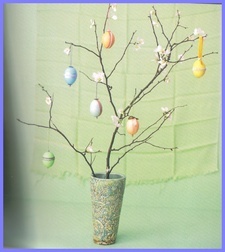 So, Easter's next week? How is that possible? There is a mountain of snow in our backyard that certainly isn't going anywhere in the next week! Damn...how will we ever do an easter egg hunt (that Calvin is so excited about--remembering last year). Oh yeah, and how will I ever get any Easter "stuff" done? I've got half of ONE knitted bunny done--I still need to do another. Yikes. 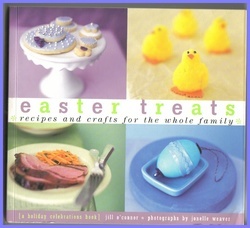 So, in the interest of procrastinating on easter crafting even longer, I bought this book at Marden's yesterday. It's adorable! So much great stuff in there that I won't have time to make this year (but next year, you know, once there are THREE children in the house--then, THEN....I'll have LOTS of free time for Easter crafts!! Ha!). 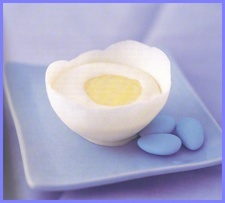 Here are two of my favorite "must do's" in the book..... the egg tree, and the "Ivory Eggshells with Lemon Cream". Oh yumminess.